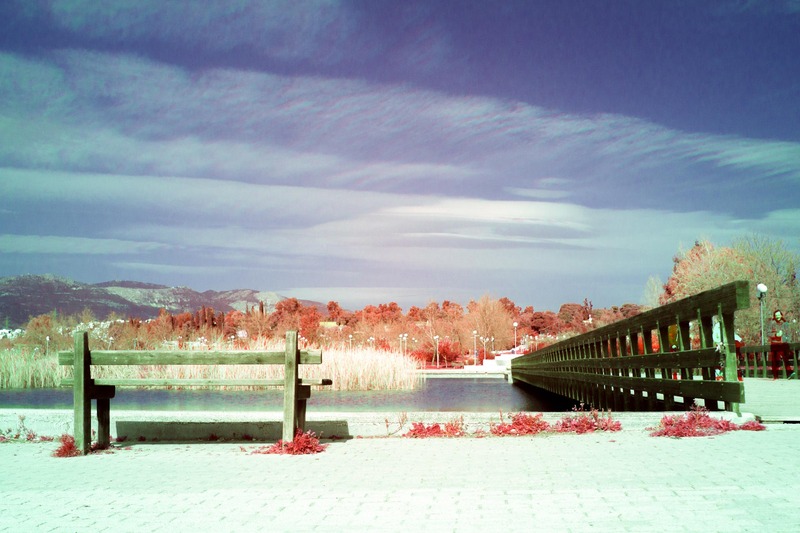 An infrared trichrome of a bench in front of the pond, right next ot a bridge used by pedestrians to cross this body of water. I continue to do the tests in infrared trichrome in order to nail down the technique before trying to do some more serious projects, when the right season comes. If I made this photo later in the year, when the reeds to the left were not dried out, they would be red instead of white. The good thing about them at present though is the fact that if they had this red colour, they would blend with the trees in the background and they wouldn’t create a new visual layer in the composition, as they do now. This park is located in the western suburbs of Athens. I have gone there a few times in the past but more as a quiet place to hang out with friends and not so much for photography (although I have presented pictures from that place in the photoblog). This time I went alone as the weather was good and I wanted to focus more in exploring area and doing some test shots. I did find some interesting subjects but they will be themes for future photo sessions, when the results will be more impressive. For the time being though, this photo of the bench in front of the pond was an image I could present right away because as I already explained it is better the way it is now. So, the results were good for a first photographic visit there and I will certainly return in a few weeks to make more infrared photos using the rich vegetation of the park.